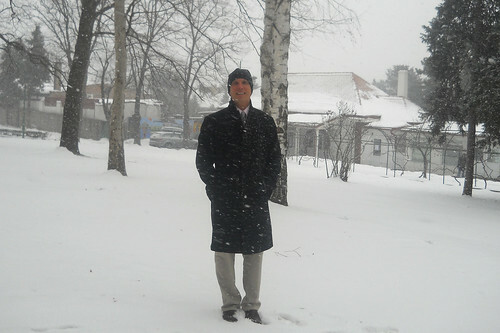 The snow and cold weather continues here in Belgrade. I am pictured outside yesterday afternoon on the grounds of the high school on duty. There is about 6 inches on the ground and yesterday it snowed again. This is unusual for March for Belgrade. Highs are usually in the 50s and it is normal to be above freezing. Right now it is 28F and overcast. I am liking the cold temperatures, especially for running. The snow makes Belgrade look nice and temperatures around the freezing mark are not really that cold. The basketball season is finally winding down for me. We completed our regular season this week with a 10 and 5 record. We now leave for the CEESA Tourney in Latvia next week to complete the year. Everyone is doing well. Nadia has report cards this weekend to work on. Owen learned another song on the guitar (When The Saints Go Marching In). Ocean is enjoying “cooking” in her toy kitchen, yesterday she invited the nanny to lunch. She is carrying around her Hello Kitty purse everywhere, even to the bathroom. Oliver is always looking to elicit a laugh from Nadia or I – he is quite the character. We are all looking forward to a nice quiet weekend at home. I’m hoping the toboggan hill is in good shape for the kids. I am making a cameo appearance in the One Act plays this evening and Saturday at the school.